Many communities throughout the Heritage Area have developed walking and driving tours to help share their unique stories. A variety of self-guided tour brochures are available, allowing visitors to discover the rich heritage of the region simply by driving through the countryside or walking through some of the region’s historic downtowns. There are a number of tours that celebrate the unique history, art and culture of the region. For example, the Hex Barn Art Tour takes visitors through some of Berks County’s most scenic roadways on a journey of discovery to over 20 barns bearing striking and distinctive Pennsylvania Dutch hex signs. A self-guided walking tour of Pottsville highlights the city’s murals, while another focuses on points of interest, including America’s oldest brewery, the prison where the Molly Maguires were hanged, Pottsville’s oldest church, and many more sites. Not all driving and walking tours are self-guided. Historic Germantown Tour Packages offer themed, guided tours that give an indepth look at several of Germantown’s 15 historic sites. 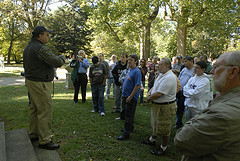 A wide variety of guided walking tours can be found in Philadelphia (see link right).